Give a group of people the option to live in an inhospitable place, away from other settlements, in a location which is likely to get them all killed and you will never run out of volunteers. This fact of life is especially true for humankind. There is no shortage of small settlements and communities living in the fringes. Some of them live precariously, walking on a knife’s edge every season for survival. Some live in the middle of the desert, some in remote islands, others make their homes next to a known active volcano. The people from Shirya make call the Lake of the Lost their home. 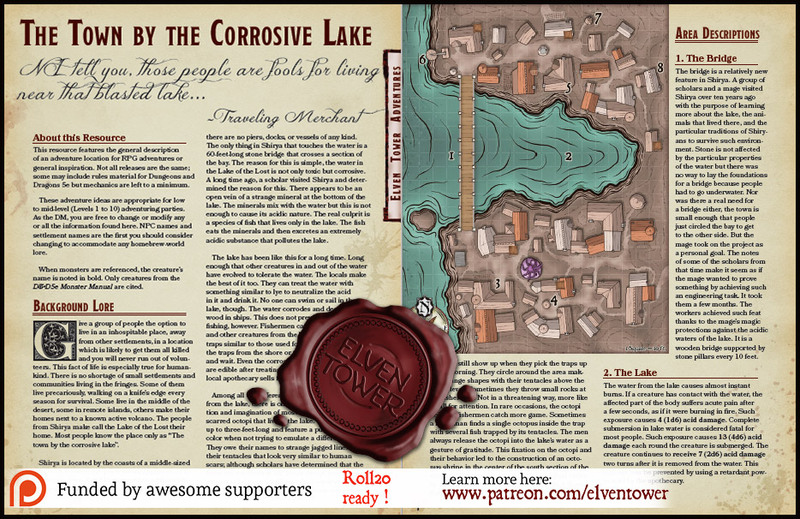 Most people know the place only as “The town by the corrosive lake”. Shirya is located by the coasts of a middle-sized lake. 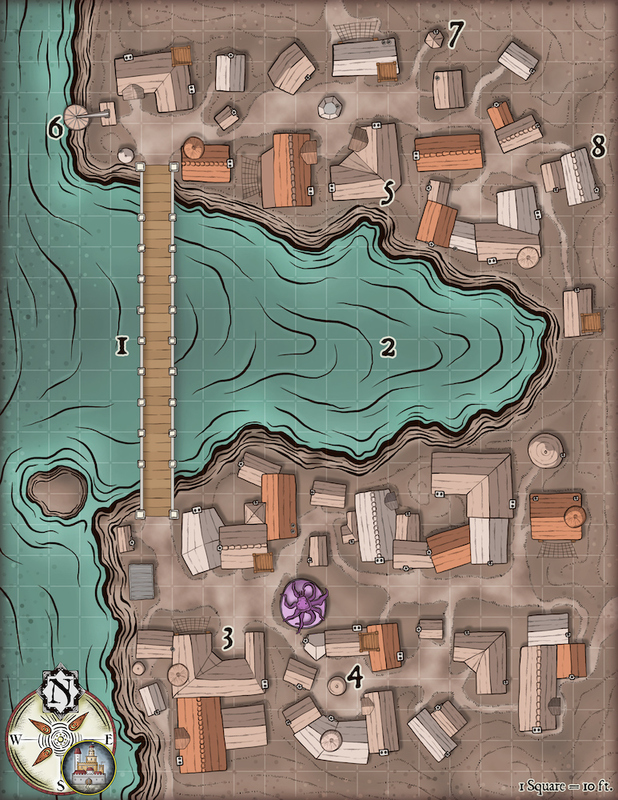 To a traveler, the place would appear to be a fishermen town, just like many other settlements by the sea or a lake. But then he would notice that there are no piers, docks, or vessels of any kind. The only thing in Shirya that touches the water is a 60-feet-long stone bridge that crosses a section of the bay. The reason for this is simple, the water in the Lake of the Lost is not only toxic but corrosive. A long time ago, a scholar visited Shirya and determined the reason for this. There appears to be an open vein of a strange mineral at the bottom of the lake. The minerals mix with the water but this is not enough to cause its acidic nature. The real culprit is a species of fish that lives only in the lake. The fish eats the minerals and then excretes an extremely acidic substance that pollutes the lake. The lake has been like this for a long time. Long enough that other creatures in and out of the water have evolved to tolerate the water. The locals make the best of it too. They can treat the water with something similar to lye to neutralize the acid in it and drink it. No one can swim or sail in the lake, though. The water corrodes and destroys the wood in ships. This does not prevent some kinds of fishing, however. Fishermen catch the corrosive fish and other creatures from the lake in square-shaped traps similar to those used for lobsters. They lower the traps from the shore or the bridge into the water and wait. Even the corrosive fish that taint the water are edible after treating them with a substance the local apothecary sells for cheap. Among all the different creatures they can eat from the lake, there is one that captures the attention and imagination of most fishermen. It is the scarred octopi that live in the lake. The octopi grow up to three-feet-long and feature a purple-tinted color when not trying to emulate a different color. They owe their names to strange jagged lines on their tentacles that look very similar to human scars; although scholars have determined that the lines are not scars at all. These octopi have demonstrated to be more intelligent than other varieties of their kind. They avoid the fishing traps most of the time but still show up when they pick the traps up every morning. They circle around the area making strange shapes with their tentacles above the water level. Sometimes they throw small rocks at the fishermen. Not in a threatening way, more like a call for attention. In rare occasions, the octopi help the fishermen catch more game. Sometimes a fisherman finds a single octopus inside the trap with several fish trapped by its tentacles. The men always release the octopi into the lake’s water as a gesture of gratitude. This fixation on the octopi and their behavior led to the construction of an octopus shrine in the center of the south section of the town. All fishermen now start and end their shifts by asking the grandiose altar for more luck than they had the previous day. The bridge is a relatively new feature in Shirya. A group of scholars and a mage visited Shirya over ten years ago with the purpose of learning more about the lake, the animals that lived there, and the particular traditions of Shiryans to survive such environment. Stone is not affected by the particular properties of the water but there was no way to lay the foundations for a bridge because people had to go underwater. Nor was there a real need for a bridge either, the town is small enough that people just circled the bay to get to the other side. But the mage took on the project as a personal goal. The notes of some of the scholars from that time make it seem as if the mage wanted to prove something by achieving such an engineering task. It took them a few months. The workers achieved such feat thanks to the mage’s magic protections against the acidic waters of the lake. It is a wooden bridge supported by stone pillars every 10 feet. The water from the lake causes almost instant burns. If a creature has contact with the water, the affected part of the body suffers acute pain after a few seconds, as if it were burning in fire. Such exposure causes 4 (1d6) acid damage. Complete submersion in lake water is considered fatal for most people. Such exposure causes 13 (4d6) acid damage each round the creature is submerged. The creature continues to receive 7 (2d6) acid damage two turns after it is removed from the water. This damage can be prevented by using a retardant power sold by the apothecary. The town has no official government or leader but all people defer to Chief Jillard for important decisions, otherwise, the town self-manages to a good degree. Any kind of threat or worry for the whole town may involve Chief Jillard hiring adventurers to fix something. Shirya is far enough from other settlements that metal money has lost its appeal and use. People accept gold only if pressured by visitors, though. Otherwise, barter is the method of choice for local trade. Fishermen, farmers, artisans, and other workers come to the barter market to exchange their wares for other necessities. Visitors looking for a place to stay are promptly sent to Jeena’s house, a large building by the north side of town. Jeena runs a makeshift tavern in the first story of her house with the help of her two sons Gerald and Hip. If there is a need for it, she can rent out up to two bedrooms in the second story. There is no other way in town for visitors to stay other than the stables. Yurl (Area 8) is trying out a new method to fish more with a large circular cage he plans to lower to the lake with a modified winch. The device is not complete yet and thus has not been tried. They townsfolk love Yurl’s creativity but are currently betting for or against his strange looking device. Whether he succeeds or fails, Yurl is sure to get some love and hate. Ana Khouri is a middle-aged woman and a student of the occult. She knows her ways with strange ingredients and the ways to mix them to obtain unexpected results. Her largest income comes from selling acid retardant powder for the treatment of acid burns and the substance which turns water drinkable again. Yurl is the only non-human in town, a gnome. Loyal to human’s preconceptions of what gnomes do, Yurl is an accomplished engineer and a user of a few choice spells. If it were not for Yurl and Ana (Area 7), the standard of life in Shirya would not be a fraction of what it is today. Yurl designed the fishing trap boxes everyone uses to catch fish and crustaceans, he is also currently designing a new kind of trap with a cage and a winch (Area 6). But Yurl’s grandest invention is yet to be tested. A large metallic vessel with the rough shape of a stingray dominates the center of his hangar. Yurl is designing a submersible vessel able to withstand the pressure and the acid nature of the lake. He thinks it is possible to explore the rift where the minerals come from and perhaps close it. Yurl acknowledges that closing the rift would cause the destruction of a large part of the local ecosystem but maybe the sacrifice is something worth doing for the future of the community. If it happened, the lake would lose its acidity on its own over a period of 3-5 years.